This extended example is to demonstrate a simple application of using RLink, and to show what considerations to make when using it. It is not an AIMMS, or R tutorial, nor is it an introduction in machine learning. We will use the nnet package that is part of the base install of R. This is a package for feed-forward neural networks with a single hidden layer, and for multinomial log-linear models. 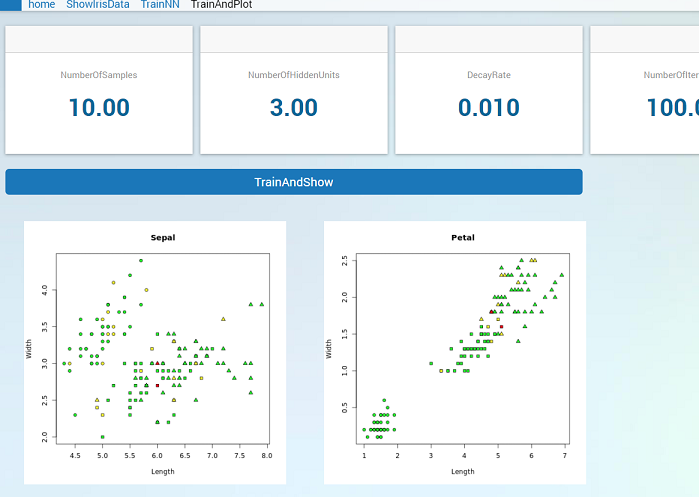 Calling scripts: Train a network using the data set and demonstrate how scripts are used. Plotting and WebUI: Plot the data set in R and show it using the image widget in the WebUI. The nnet packages comes with the iris data set which is a well known “classic” data set. This data set contains 3 classes of 50 instances each, where each class refers to a type of iris plant. We will use this data set first to show how data can be sent to AIMMS. Later we will use this data set to train a network and make plots. We will setup everything needed to use RLink and import the iris dataset into AIMMS identifiers. We will do this by calling lines of R code directly using ExecScript. The MapName, DataMap and XA declared here will be reused throughout the examples. This iris data sets consists of 3 different types of irises (Setosa, Versicolour, and Virginica) and gives the petal and sepal length and width for 50 examples each. So in R we have a data frame with 5 columns: Sepal.Length, Sepal.Width, Petal.Length, Petal.Width and Species. In AIMMS we define the parameters to read in those values. ( IrisOut  , PetalWidth   , 6  , 0   ) : "Petal.Width"
The strings on the right hand side are the names in the data frame. SampleID is not yet part of the data frame. We need it as domain for all other parameters and have to add this to the data frame. Now we can reset and associate the data map with map name “ShowIris”. Before we can use package nnet we have to “load” it into R using the function library. We can also make a set KindOfSpecies containing the iris species. For this we need to append the data map. ( KofS, KindOfSpecies, 1, 1) : "KindOfSpecies"
Replace the old data map with the new one and clear set KindOfSpecies. Now we can create a data frame dfnames with the levels from column Species of dfiris and give the colum name KindOfSpecies. We will now train a network with the data set and show the resulting weights. This will be more involved and so we move all R code into scripts. All scripts are placed in directory r in our project. Note that in the remainder of the example we will skip some of the overhead and not describe the adding of the data map and the clearing of identifiers. In this example we will create a network nn. The network has parameters called weights that will be tuned during training by presenting some examples from the iris data set. The network has 3 outputs corresponding to the three species with values ranging from 0 to 1. This output represents the likelihood of this species given the input values, which are the sepal and petal lengths and widths. The output with the highest value (so the most likely) determines the predicted species. Note that a hash (#) indicates a comment in R. At the bottom we see that we create a network nn. The first argument defines the formula that is being formed. Here they are the names of the column of dfiris (second argument): column Species is output and columns Sepal.Length, Sepal.Width, Petal.Length, Petal.Width are inputs. We do not use the entire data set as indicated by the third argument. Array sampidx, determined in the middle, contains nsamp samples selected from each species. We can select it this way because the data set is sorted by species. So we take nsamp rows from 1 to 50, and nsamp rows from 51 to 100 etc. Besides nsamp we also have to specify nhids (the number of hidden units of the network), decayrate (the decrease of weight changes during training) and the maxiter (number of iteration steps). We like to set these values from AIMMS so at the top of the R code we do aimms::GetData to read data into data frame dfin. After that we can assign the values from dfin to nsamp, nhids, decayrate and maxiter. Then, once writing the code in R is done, the value NOAIMMS should be set to FALSE so it can be called by RLink in AIMMS. ( ArgsIn  , NumberOfIterations   , 4  , 0   ) : "maxiter"
p(banner tip). Note the slash in 'r/trainnn.r' is the path separator. File trainnn.r is in the r directory in the project folder. If we don’t change the working directory in R using function setwd, the project folder is the working directory, so we have to tell R to look inside r to find file trainnn.r. Here, even on windows, slashes have to be used as path separator. Drawback of absolute paths are that the project only runs on one particular machine and is not platform independent. The R function stop will throw an error that is caught by AIMMS and shown in the Error/Warning panel. The weights of the network are stored in the array nn$wts (the $ is R syntax for wts of object nn). The number of elements of nn$wts depends on the number of hidden layers. Each hidden unit has 5 weights, 4 for the inputs and one bias. The output units have one weight for each hidden unit plus one bias. To present this neatly we have to rearrange wts. The constrain we have is that we need to create a data frame with a fixed width to be able to define a data map in AIMMS. The number of inputs and outputs are fixed and the only variable is the hidden units. For the hidden units we can define a data frame with a column for each input plus one for the bias. For the output units we can take a data frame with a column for each outcome. In this way we can add hidden units by adding rows to the data frames. # weights hidden units: names default to "V1" "V2" "V3" "V4" "V5"
# weights output units: names default to "V1" "V2" "V3"
This code uses nn$n which contains the network structure, where nn$n is the number of inputs, nn$n is the number of hidden units and nn$n is the number of outputs. First we create whidx containing only the indices of the weights of the hidden units. Then we create a data frame dfwh by taking only the weights of the hidden units and convert it first to a matrix with nn$n (=number of hidden units) rows. Data frame dfwo is created the same way with the remainder of the weight and specifying nn$n (=number of outputs) columns. ( WeightsOutputUnits  , WeightsOut3   , 2  , 0 ) : "V3"
Here the HiddenUnitID is a set with index hu and the rest are parameters with index domain hu. The "HidID" is the column we added to both data frames. All other string values were default names given by R to the columns when converting the matrices into a data frames. If we want to test the network we can compute the confusion matrix on the samples that were not used for training. In the confusion matrix the columns represent predicted outputs computed by the network using nn$wts and the rows represent the correct outputs given in the data set. The values represent the frequency of the occurrence over the test set. cm <- as.data.frame(table( # names default to  "Var1" "Var2" "Freq"
( ConfusionMatrix  , Frequency , 3  , 0   ) : "Freq"
p(banner tip). Instead of defining the data map in AIMMS, a data map can also be defined in a file and read using read from file datamap.txt. In this way the data map can be stored with the R scripts. Till now we only moved data back an forward between AIMMS and R. The WebUI can be used to visualize the data using different types of graphs, but R has plotting capabilities by itself. We will show how a plot made by R can be shown the in the WebUI. If this path and the file names are passed to script plotresult.r it can create those plots where the image widget can find it. We want to make a plot that shows the data used for training and the test results for each species. Again we have to check first if nn exists, and if it does we know that trainnn.r was called and that also sampidx exist. We can make a data frame dftrain containing an extra column Result indicating that these are samples from the train set. The remainder of sampidx is used to specify the data frame dftest, where extra column Result now contains FALSE or TRUE indicating whether the sample is predicted correctly. ( ArgsIn , PetalImg , 3 , 0 ) : "petalpng"
Now we have a function that can be called to generate the test plots. If we make a procedure in AIMMS that first calls trainnn.r and then plotresult.r we can make a button in the WebUI that will train a network and show the plots of the results. We can then simply make an interactive WebUI application that allows us to choose the input arguments, press the button and show the result. In our example application the image folder should start empty because first the R code has to run and generate the images. When making an aimmspack it is possible that the image folder is not included because it is empty and then the png device will fail in creating the images. You can place an empty do_not_delete.txt file in the image folder to make sure that the folder will not be accidentally excluded from the aimmspack.